"Of course, after this match we lost confidence but maybe it is better because sometimes my players show me they have too much confidence." Chelsea had looked in control after Ruben Loftus-Cheek's deflected effort had given them an 18th-minute lead, but second-half goals from Raul Jimenez and Diogo Jota saw Wolves fight back for victory. "Of course, after this match we lost confidence but maybe it is better because sometimes my players show me they have too much confidence," he said. "It is more important to talk about our attitude after the first goal. We were not the same team as before, we were another team. "Maybe it was important for the result but not for me. I have to understand why the team was suddenly another team because we were in control of the match. Highlights from Wolves' win over Chelsea in the Premier League. 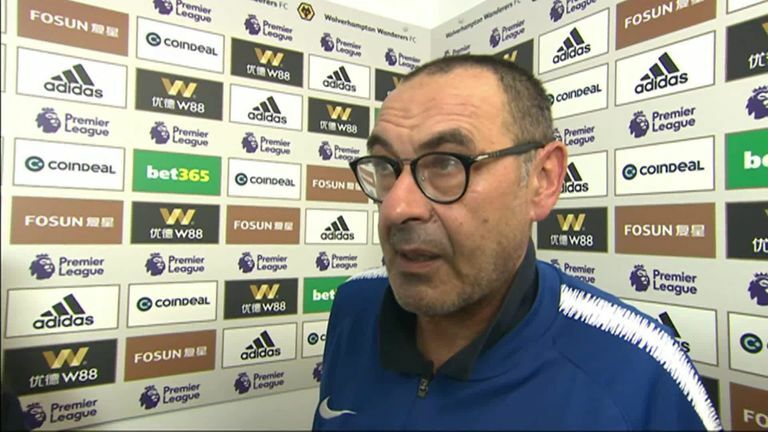 "I thought we played very well for 55 minutes," Sarri added. "After the first goal, that was an accident because we were in control of the match, we were suddenly another team, without our distances and without our football. " "I am very worried but not for the result, for the fact that we did not react to the first goal of the opponent. We didn't react at all so I am really very worried for this, not the result." The result means Chelsea, who are down to fourth, are 10 points behind league leaders Manchester City ahead the two sides meeting at Stamford Bridge on Saturday. When asked if his side are out of the title race, he said: "As I said before, Manchester City is in another category. Manchester City at the moment is not in our category. We have to play and we have to fight to be in the top four, I think. "The result is very difficult for this because I know very well in every match you need points. In Serie A, in the last championship, I lost with 91 points so I know very well that in every match we need to gain points. "It is very difficult, the result, for staying in the top four."